For choir members and representatives attending the Street Choirs Festival in Whitby. We’ll be holding a meeting in the the café in the Pavilion complex on Sunday Morning at 11 am (coinciding with the second set of workshops). If at all possible, it would be great to have at least one person from each choir. And of course volunteers are always welcome, but don’t be put off coming if you’re already fully committed to other things – your ideas and input will be welcome. This entry was posted in Uncategorized on 2015/07/11 by frankwires. Ray Davies, the indefatigable peace activist, socialist, community campaigner, loving husband and father died aged 85 on May 7th, Election Day. Ray was an active member of the Labour Party for over 60 years and a councillor for more than 50. He would have lamented the election of a Tory government determined on austerity politics and Trident replacement. And then he would have resisted such policies with all his considerable conviction, commitment and charm. Everyone who met him, took action with him, or sang with him has their stories of Ray. I often tease that I never saw Ray Davies at Aldermaston or Faslane… Because he had locked-on, been arrested, talked peace compellingly to his arresting officer, and was singing in his cell before I even got up! 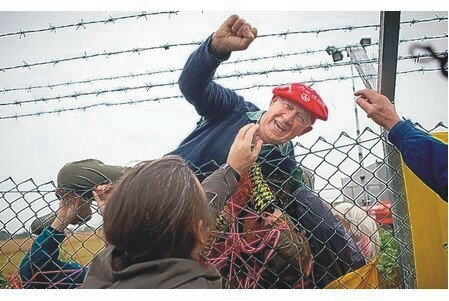 His daughter Rachael’s favourite picture of Ray is him go ing over the barbed-wire fence at Hinkley aged 84. As happy taking direct action as being a great dad, in the picture Ray looks positively gleeful. Ray fought hard on numerous fronts and, although he lived just four miles from his birthplace in Llanbradach, he was known across the world, as messages of condolence from as far afield as Gaza and the US made plain. On one visit to Gaza, a bullet grazed Ray’s head as he was escorting ambulances carrying wounded Palestinians to hospital. Betty Hunter was amongst the representatives of Palestine Solidarity Campaign who attended Ray’s memorial on 15th May. Hanif Bhamjee represented Wales Anti Apartheid. 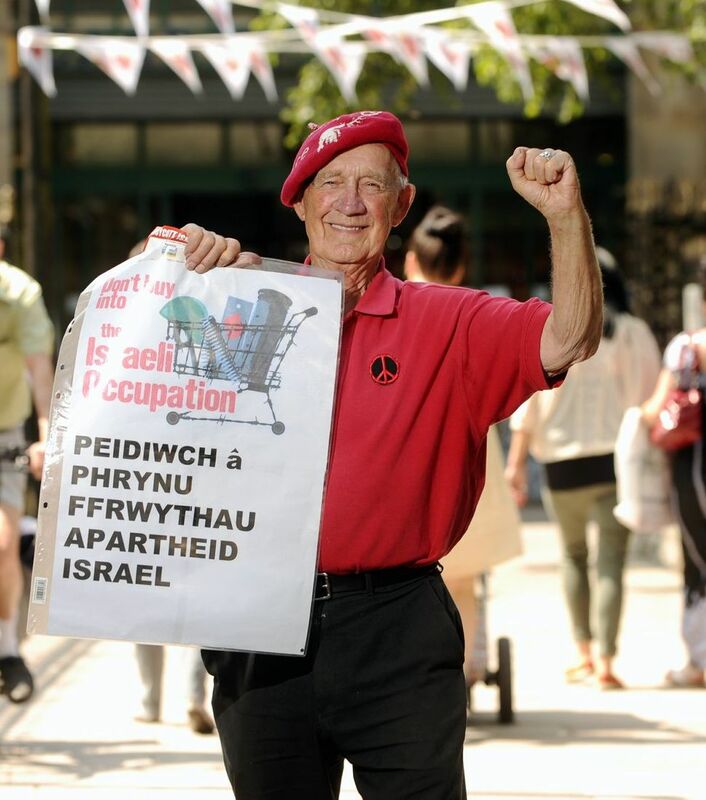 With Côr Cochion , the activist choir which he helped form, Ray was once arrested in Merthyr Tydfil for singing in support of the South African boycott. On another occasion, also in Merthyr, Côr Cochion were told they could not stand and sing against open-cast coalmining in a private shopping mall. So, they simply walked around the mall singing their hearts out, trailed by two hangdog security guards. Ray Davies believed in the power of music to communicate and change lives. Côr Cochion, Caerphilly Male Voice Choir and Cardiff Arms Park Choir all sang movingly at his memorial. Ray believed in a strong political voice for Wales too. He recently spoke on the steps of the Welsh Assembly, calling for greater powers to be devolved from Westminster. Members of the Yes for Wales campaign were at the memorial to show their appreciation. Old comrades from the Anti Poll Tax campaign also came from London to join the commemoration. Others present included, the Lord Mayor, Ray’s fellow town and county councillors, MEP Jeff Cuthbert, MP Wayne David and leader of the Green Party in Wales, Pippa Bartolotti. The local community attended in great number too: local environmentalists campaigning to preserve the beauty of the woodlands in Graig y Rhacca; residents opposing the development of Ray’s beloved Cwm (valley); local historians; and the many people who had come to Ray for advice and help. Ray bore his pancreatic cancer with the same courage with which he faced the dangers underground as a boy miner, the police on picket lines during the Miners’ Strike, teargas and tanks in Ireland, and bullets in war-torn Gaza. His memorial in Bedwas Workmen’s Hall was packed to capacity with more than five-hundred people drawn from every aspect of his remarkable life. On the lectern was Ray’s trademark red scarf and ‘heddwch’ (peace) beret. Those present heard that Ray was first and foremost a human being – not a saint or a leader. He acted on what he knew was right – and was a man not afraid to admit it if he sometimes got things wrong. The memorial concluded with a rousing rendition of ‘Hey Jude’ sung by everyone present. Ray Davies truly believed he could change the world, and he made us believe we could too. So, now it is our turn to preserve the things we love that he fought so hard for. Ray left a big hole in our lives, but we must all do the best we can to carry on his spirit. We too must be indefatigable. A celebration of Ray’s public life – which will focus on his contribution to local, national and international politics – will be held on the 4th of July at the Temple of Peace in Cardiff. With thanks to Jill Gough, Wendy Lewis and Rachael Christophides. This entry was posted in Uncategorized on 2015/07/02 by frankwires. 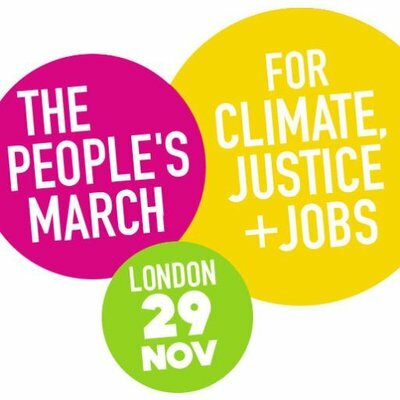 Raised Voices will be singing on the Climate demo, and are meeting at the corner of Surrey Street and Temple Place, at 12.00 and others would love you to join them. Although some songs are unique to them, you’re welcome to download their songsheet (pdf). Please Leave a Reply to use comments on this post for Campaigning Choirs updates and planning. This entry was posted in Uncategorized on 2014/09/19 by frankwires. Birmingham Clarion Singers (facebook) would like to invite choirs to join us at the protests against the Conservative Party Conference on 28th September in Birmingham. Details not yet finalised, but wanted to let people know now so that the date can be saved. We are aiming to use a similar song list to that which was used at the last demo in London. This entry was posted in Uncategorized on 2014/08/15 by frankwires. 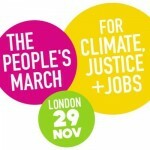 The demo will assemble at 13.00 for 14.00 start. Hopefully there will be large numbers on the demo, there could be parking problems, train would be a good alternative as it is right in the centre of the city. For those who come early,we as a choir will be singing for a short while from 12.00 to 12.30 in the city centre. Then move to the steps of the law courts for a massed sing from 13.00 till 13.45. We will then move to a point on the demo to sing when the march arrives. Cor Cochion have a list for those who wish to stay overnight or maybe longer, for there are many events planned over the following week. This year’s Street Choirs Festival will be in Hebden Bridge over the second weekend in July. Of course proposing them is just the first step – they’ll need booking and organising too! This entry was posted in Uncategorized and tagged Hebden Bridge, Street Choirs Festival on 2014/04/12 by frankwires. East Lancs Clarion Community Choir will be singing at this event – possibly the last Council funded Burnley May Day Rally. We welcome all singers from our region who’d like to come & sing with us on the March & busking in the Park. See comments below for a sing-along songsheet. This entry was posted in Demonstrations Marches Rallies, Regional, Song Sheet and tagged Burnley, Clarion, May Day, Song Sheet on 2014/04/05 by frankwires.